At the 2007 Winter NAMM Show, a music and recording industry convention recently held in Anaheim, California, Behringer introduced their Podcastudio USB Bundle, a kit for professional podcasting, music production and digital home recording. 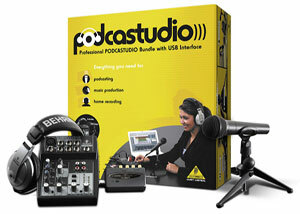 The Podcastudio is expected to ship in 2nd quarter for US $149.99. Last year, Behringer introduced a Firewire-based podcasting kit.